An energy recovery ventilator saves energy while providing fresh air to the whole house. Winters in Wisconsin are cold, and if you're going to keep a home warm and free of drafts, you must build a nearly air-tight structure. However, the air in such a home will quickly become stale and unhealthy. Cooking odors, excessive moisture from bathing & houseplants, and carbon dioxide from the the occupants breathing are all forms of indoor air pollution. So in a tightly-built house it's important to provide good ventilation. It's also important to do this in an energy efficient way. An energy recovery ventilator is the answer. These simple units consist of a box with two fans and a special "core" element inside. 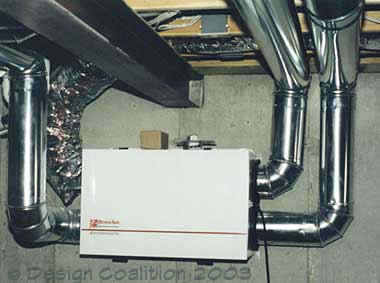 Above: An installed energy recovery ventilator or ERV, sometimes called an "air-to-air heat exchanger." The ERV uses the stale outgoin (warm) air to heat the incoming (cold) fresh air. The two air streams pass through the cor, exchanging heat but never actually mixing. The transfer isn't perfect - about 75% energy recovery is typical - but it allos the homeowner to saveheat and keep the windows closed while still enjoying fresh air. Our ERV unit will come from RenewAire, a local Madison company. These machines operate completely silently, and can be controlled via a timer, a humidistat or a combination. Small ducts will draw stale air from the bathrooms and the kitchen. For more information, visit the RenewAire website.